It was refreshing to catch up, see our kids play together and explore the countryside. Keeping up long distance relationships can be so hard and I appreciate the extra effort she made to include us in her vacation. Peaches are my favorite fruit and the banner of hot summer days. It’s hard to beat a fresh, ripe peach for an afternoon snack (except maybe ice cream, always ice cream.) Summer produce is in full swing by the time peaches are ready and I love meals full of lots of fresh fruits and veggies: corn, zucchini, peaches, apricots, blueberries, beets. Still trying to instill a love of all things fresh produce to my children. 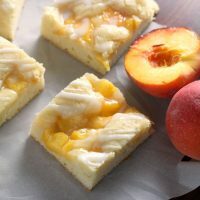 I was dreaming up recipes I could use fresh peaches for and I first thought of these fresh peach pie bars. I’ll admit it, I’ve been a pie bar addict recently. Every month this summer I’ve made a new flavor. 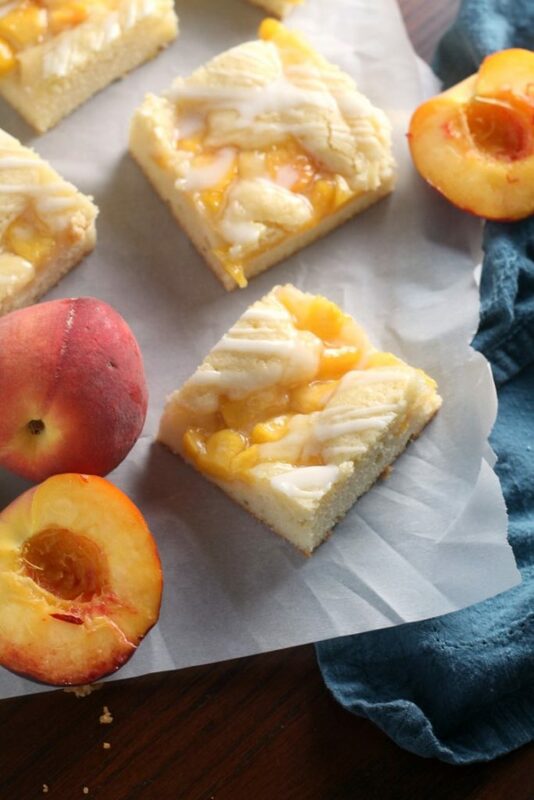 First it was cherry pie bars, then blueberry pie bars and now fresh peach pie bars. And don’t ask me to pick a favorite, it depends on what month of the year it is, what fruit is in season and what I’m craving. 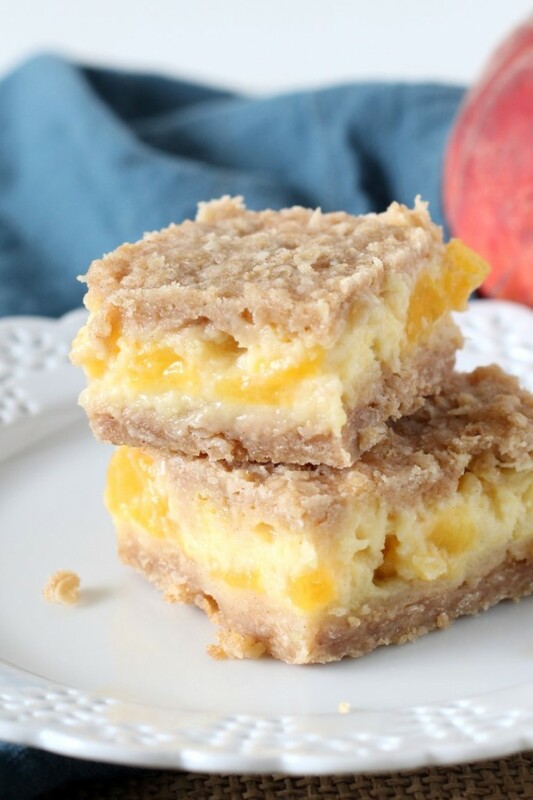 Watch out, next month it may be apple pie bars. What fruit would you turn into a pie bar? To make the fresh peach filling, whisk together the cornstarch and sugar in a medium saucepan. Toss the diced peaches in the fresh lemon juice and add to the saucepan along with the water. Cook over medium heat, whisking frequently. Cook until the mixture thickens and begins to bubble. Set aside to cool. To make the bars, preheat the oven to 350 F. Cream the butter and sugar together in a large bowl. Beat in eggs and vanilla. In a separate bowl, whisk together the flour, baking powder and salt. Add the dry ingredients to the wet and stir until combined. Grease a 10 x 15 inch baking pan. Reserve 1½ cup of batter, spread the rest on the bottom of the greased baking pan. 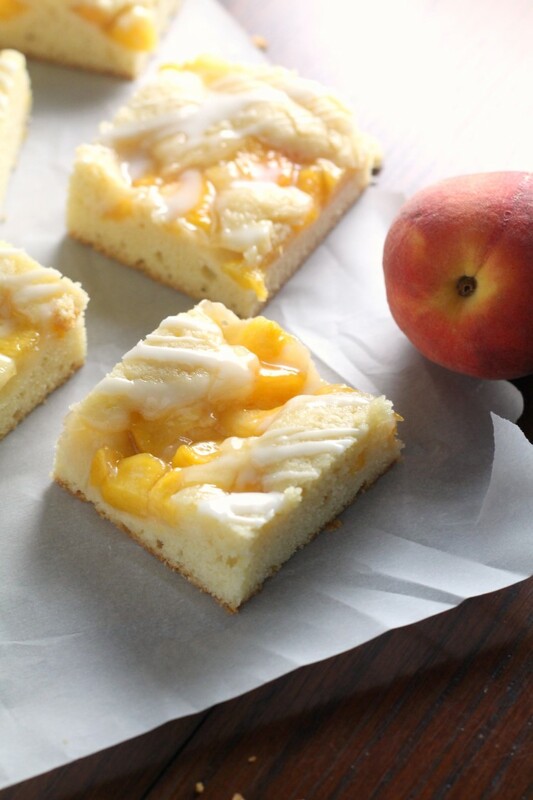 Spread with the fresh peach filling. Using a teaspoon, dollop on the reserved batter in drops. Bake in preheated oven for 35 minutes or until lightly browned and toothpick inserted in the middle comes out clean. Do not over bake. Let cool. To make the glaze, beat the powdered sugar, vanilla extract and enough milk to form a smooth consistency. Drizzle on cooled bars. Cut and serve. These are better the second day as the batter absorbs some of the moisture from the filling. *1 (20 ounce) can of peach pie filling may be used instead of the fresh peach filling. 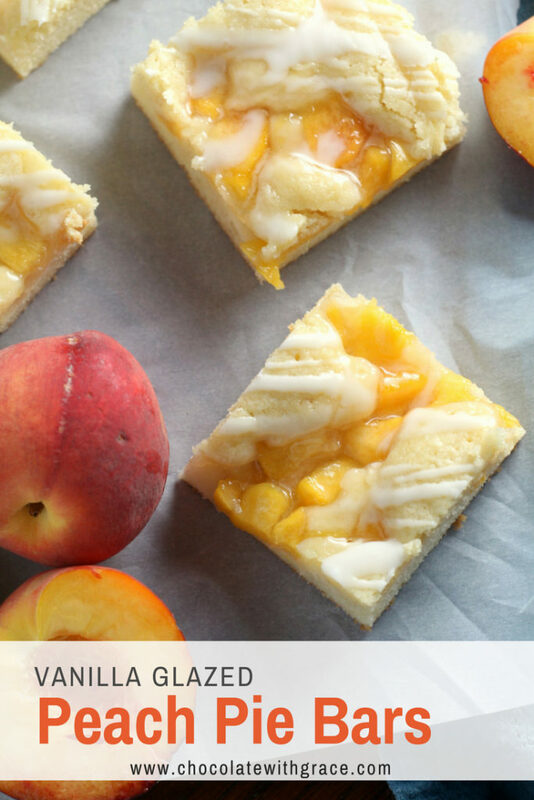 If you love peach pie as much as I do, I’m sure you’ll love these twists on peach pie too! Fresh Peach Pie from Dessert Now! Dinner Later! 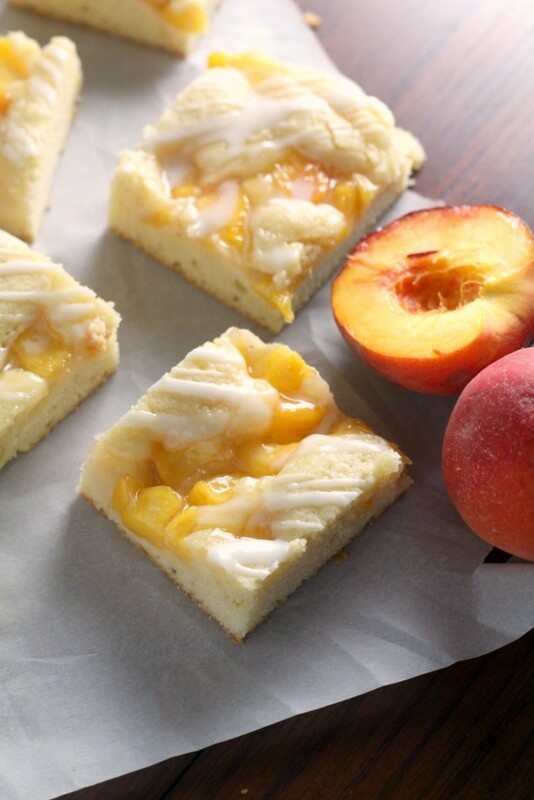 These peaches ‘n cream bars are another great use for fresh peaches. 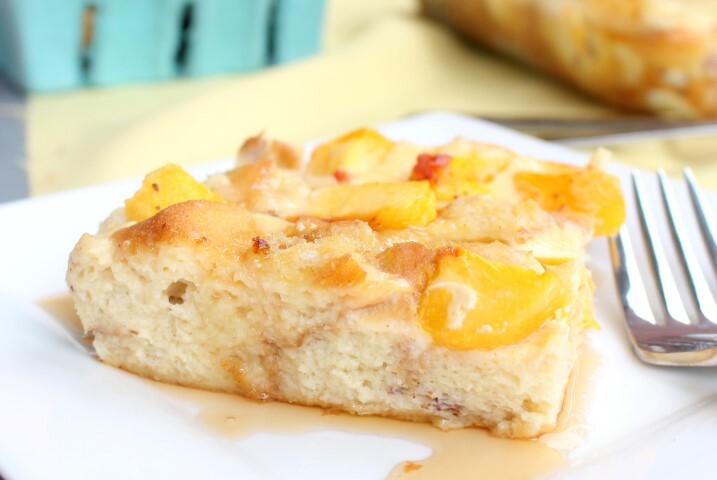 And this Peaches ‘N Cream French toast casserole is an old recipe on my site that deserves to be made. 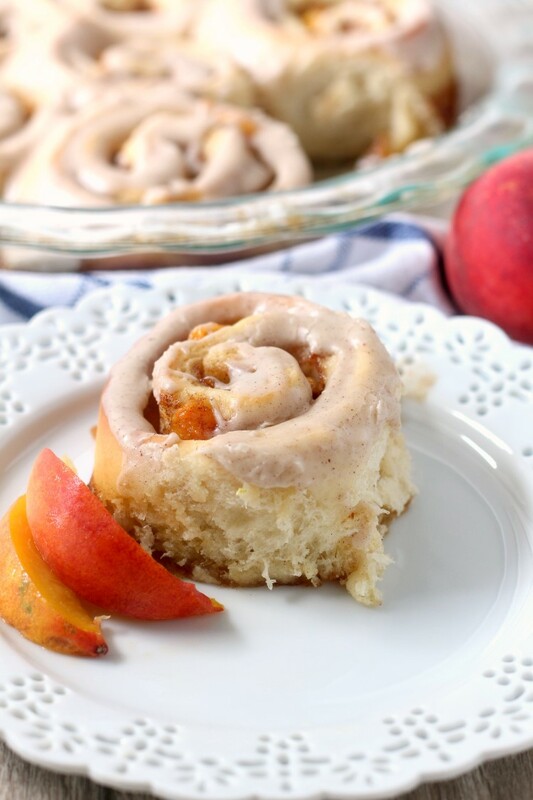 And don’t forget about the brown butter peach sweet rolls I posted earlier this month!